As the issue begins, Donatello’s dreams are being disturbed by a disembodied voice, questioning the distressed Turtle about how he can sleep while the Voice’s granddaughter is struggling. On the following page we find ourselves inside of Don’s dream, where he sits as a giant upon a mountain in the forest. By the mammoth Turtle’s side is an equally gigantic Native American chief, who floats cross-legged in the sky. We then see an even larger muscled, caped monster in battle with a beautiful Native American woman. “And my granddaughter, who you call Radical.” finishes the apparition. The two first appeared in Tales of the TMNT #5. And crashes onto Leo’s bed, awakened from the dream (as are the rest of the guys). Meanwhile, Complete Carnage and Radical are both lying stunned on the ground – apparently the Turtles’ shared dream had far-reaching effect! CC decides it’s time for him to go and he leaves a very weak Radical behind as he melts into the road and disappears. The TMNT report their dream to Splinter, who states that it is a powerful omen. The Sensei also reveals that he also had a dream, a vision of great peace and great destruction… as well as a giant, neon buffalo! Leo remembers that Casey had mentioned a neon buffalo, so the guys head out to search for the clue. The Turtles head to an abandoned and dilapidated “Indian Goods” store near Buffalo Rock, in the middle of nowhere, where they find an old sign in the shape of a buffalo that was once outlined with neon lights. They also find Radical sitting in deep meditation. 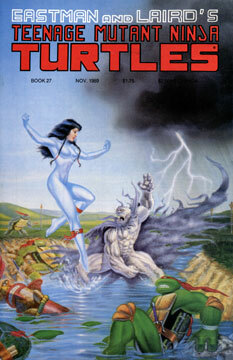 Once Radical is alerted to the Turtles’ presence, she asks Don if he’s a Dream Walker. Don tells her that it was her grandfather that brought him to her, and Radical states that her granddad was a powerful shaman who has been dead for ten years. Meanwhile, Complete Carnage emerges from the road in the nearby city of Springfield. As he walks the streets contemplating what havoc he’ll wreck, he spots an advertisement in a store window for “Radical price cuts!” which angers the villain and he smashes the window out, screaming that Radical haunts him wherever he goes. Back in the woods, Radical performs a Native American ritual in attempt to get some answers from the spirits. Radical tells the spirits of Complete Carnage, how he draws his power from man-made structures of rock, and how the changes that the white men have made to the landscape power her enemy. The air spirit, Wakinyan Tanka, answers Radical’s call and tells her that no matter the strength of her enemy, she must remember her own – and then the thunderbird flies off. Radical then tells the TMNT that they must draw CC back to this spot, as its power will hold him. They’ll be able to lure the monster to their location through the dream realm. The TMNT offer their assistance, but they ask the lady to give them some background information, so Radical explains her origin to the Turtles. She insists that she’s not a super-hero, as her powers did not originate from radioactivity or lightning. She tells of how when she was a girl, her grandfather brought her to this very spot and taught her the importance of the local beavers, who were the children of the Great White Grandfather Beaver. The shaman was honored to have the beavers set up their home in his locale. When Radical told the story to a local boy who did some chores for her granddad, the kid attempted to kill one of the animals by throwing a rock at it. Radical was able to block the missile, and the boy became her enemy. Legend states that there is a giant totem pole that holds up the world, and that the Great Beaver is at its base, gnawing the wood whenever he is angered. Radical believes that the evil spirits cursed the boy that day and chose him as their avatar, turning him into Complete Carnage. Likewise, the good spirits chose Radical to fight for the side of right… so the two are constant and ancient foes. Radical has been given the powers of the great Thunderbirds, she can fly and manipulate the clouds, while Complete Carnage holds influence over all that is man-made. Radical then explains that she has done her best to battle CC in the Dreamscape, in effort to prevent damage to the earth… but Carnage is growing stronger and wiser in his abilities, so the fight looks like it will be brought to the real world. She then disappears, telling the guys that she’ll be bringing Complete Carnage back with her when she returns. Radical bursts up from the street, which has suddenly become a river! She then captures Complete Carnage with a giant fist made of stream water, which pulls the beast to its depths. Carnage struggles but cannot break the water-fist’s grasp. A stunned CC cries out – he doesn’t understand what happened – he could have sworn the road was made of rock. As he realizes that he’s been duped, he evaporates into the water and disappears… and the entire stream also drains away to leave a dry and empty riverbed behind. Radical explains that the Coyote has an odd sense of humor, so things may not be as they seem – but it looks like the great spirit changed the rock to water just as Carnage was attempting to absorb its power into himself, thus causing him to become water and dispersing his atoms, perhaps for good. Later we see Donatello seated alone on Buffalo Rock, which overlooks a lake. Raph approaches and tells Don that they need to get going. As Donatello prepares to leave, he hears the old shaman’s voice once again. Just then Radical flies overhead to say goodbye and thanks.